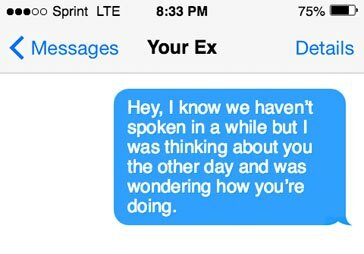 Before we talk about what to text your ex to get him back, let’s go over a quick list of what not to do. Don’t text him when you’re drunk. This is just never a good idea and is a recipe for regret. Don’t do it because you’re lonely. Make sure it’s a good idea to get back together. Missing someone isn’t enough. You need to make sure that he really is the right person for you and that the relationship would be different this time around. Don’t start a fight to get his attention. Will you get a response? Maybe. But the conversation definitely won’t go where you want it to. Don’t text him a million times I a row. If he doesn’t respond, then just leave it alone. No need to follow up with: You there? Hello???? Why aren’t you answering me?? Did something happen? Just answer so I know you’re alive! 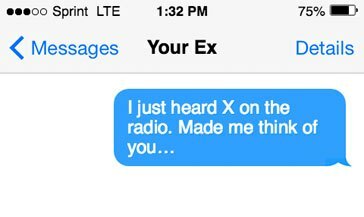 The biggest rule of all when it comes to texting your ex, or getting back together with an ex, is to first have a period of no contact, usually a minimum of four weeks. This means you don’t text or call or G-chat or communicate in any way, shape, or form. It doesn’t matter if it’s his birthday or he just got a promotion at work and you “innocently” want to congratulate him. No contact means no contact. You can read more about it and why it works here and here. The no-contact period gives him the space to miss you, something he can’t do if you’re always in his face or blowing up his phone. It also gives both of you the chance to detox from the relationship and gain more perspective and clarity, all good things. After this period of no contact, if he hasn’t reached out to you then you can establish contact through whatever means you’d like. Texting is usually the easiest and safest. The following texts are good ways to re-open the gates of communication or to get him thinking about you in a more romantic sense if you’re already in touch. Men love a happy woman. When it feels good and pleasant to be around you and to talk to you, we’re drawn to you. When it’s negative and emotionally heavy, we stay away. There is nothing more attractive than a positive, happy woman. Just one little happy, lighthearted text (after a period of no contact that gives him a chance to really miss you), can do wonders when it comes to canceling out some of the negative feelings he may be carrying. It also shows him that it’s safe to approach you. What do I mean by that? 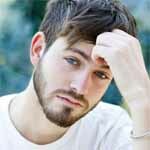 He may have been wanting to reach out to you, but didn’t because he wasn’t sure if you were still hurt or angry or bitter. 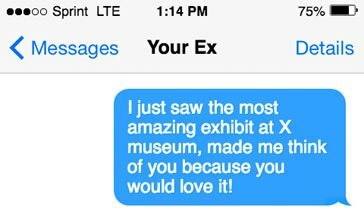 With a happy, lighthearted text, you’re showing him that you’ve moved past those ugly emotions and are in a better place, a place more conducive to starting fresh. 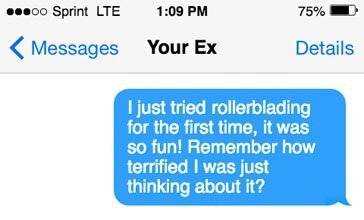 I would suggest avoiding generic texts such as: “How are you?” “What’s going on?” This might make your ex a little apprehensive … he doesn’t know if you’re reaching out to be friendly, or if you’re about to unleash on him. A better way to re-ignite a connection is to bring up a shared memory or experience. This steers the conversation to an actual direction and brings a more positive tone. 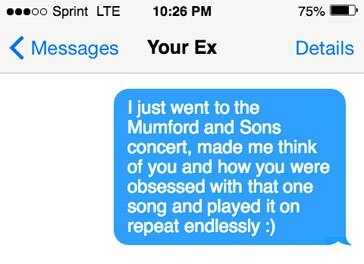 These texts show you’re thinking of him, but not necessarily about him. You aren’t crying into your pillow every night thinking you’ll never find a love like he gave you, you are moving on with your lie and sometimes things remind you of him, or you think of a happy memory, and you feel comfortable sharing it with him. The absolute best thing you can do for yourself after a breakup is work on yourself and work on being your best self. If everything is exactly the same, he won’t really be inspired to get back together. You need to change the way he sees you and the intrigue text can do just that. 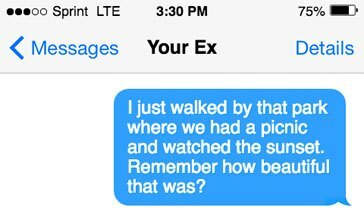 This text shows him you’re a better version of the person you were when you were with him. You’re going out more, exercising, traveling, you’re living your best life. This is the kind of woman that really captures a man’s attention. 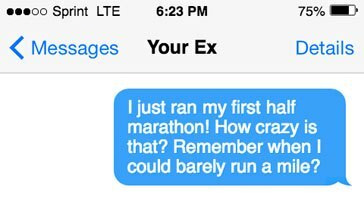 Mention something fun you did recently or something you saw that reminded you of a fun memory with your ex. 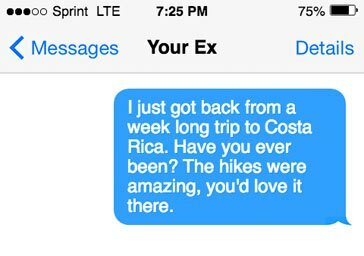 She went to Costa Rica? With who? Was she with a guy? And she likes to hike now?? The intrigue text will get him thinking of you in a different way. People are always going to idealize what they no longer have. 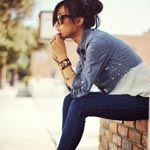 This is just a natural process that will work to your advantage after a breakup. Reminding him of the happy times is powerful and will activate feelings of longing in him for you. 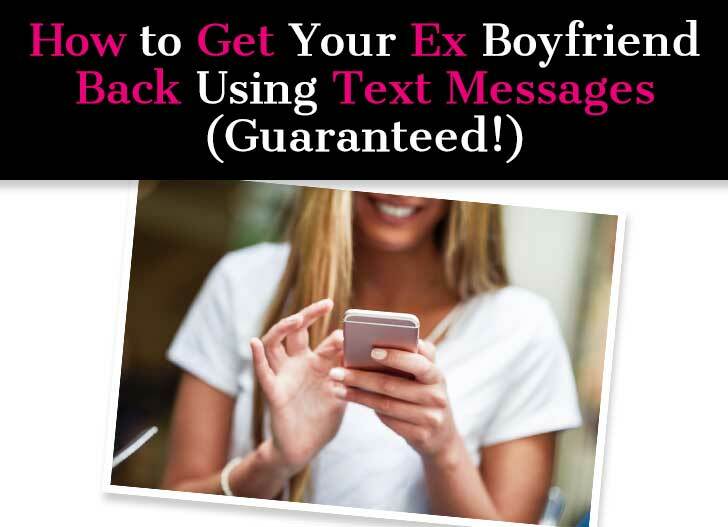 The easiest text to send is the “feeler text,” meaning you shoot him a text to feel it out and see how he responds. You’re basically testing the waters to see if he would be open to rekindling a connection. If he brushes you off, then he’s probably just not ready right now. If he pounces right away and jumps at the chance to meet and catch up, he probably misses you and wants you back in his life. Follow the no contact rule for at least 4 weeks. Send him something happy and light to show you’re in a positive place. Rouse his intrigue by texting him about something cool or exciting you did recently. Bring up a fond shared memory to activate feelings of nostalgia. Send him a feeler to see where his head is at. Great advice here. Thanks. I’m gonna try;.